We’d love your help. 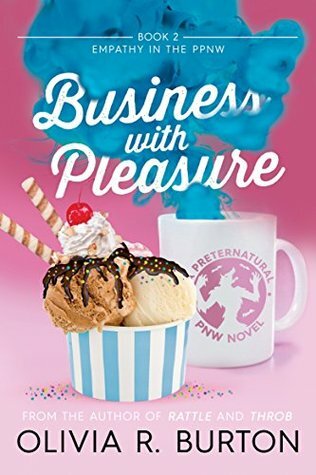 Let us know what’s wrong with this preview of Business With Pleasure by Olivia R. Burton. There's an assassin in town trying to catch a murderer, a lovesick werewolf trying to get lucky, and Gwen Arthur still has a mysterious magical marauder stealing her sugar stash. On top of all that, Gwen's estranged ex-husband Stanley’s in town asking for a favor. She’s got to help, of course, if only to ease her guilt over how they left things a decade earlier. Too bad sh There's an assassin in town trying to catch a murderer, a lovesick werewolf trying to get lucky, and Gwen Arthur still has a mysterious magical marauder stealing her sugar stash. On top of all that, Gwen's estranged ex-husband Stanley’s in town asking for a favor. She’s got to help, of course, if only to ease her guilt over how they left things a decade earlier. Too bad she’s got no idea how to deal with a rogue admirer writing him weird letters, sending gifts to his home, and threatening to show up at a convention full of his beige-clad, sugar-eschewing fans. To ask other readers questions about Business With Pleasure, please sign up. Author, vegan, drink spiller, kombucha enthusiast. Don't tell me about your kids, but ask me about my cats.